Zwartbles are “Going, Going, Gone” at Gortin! 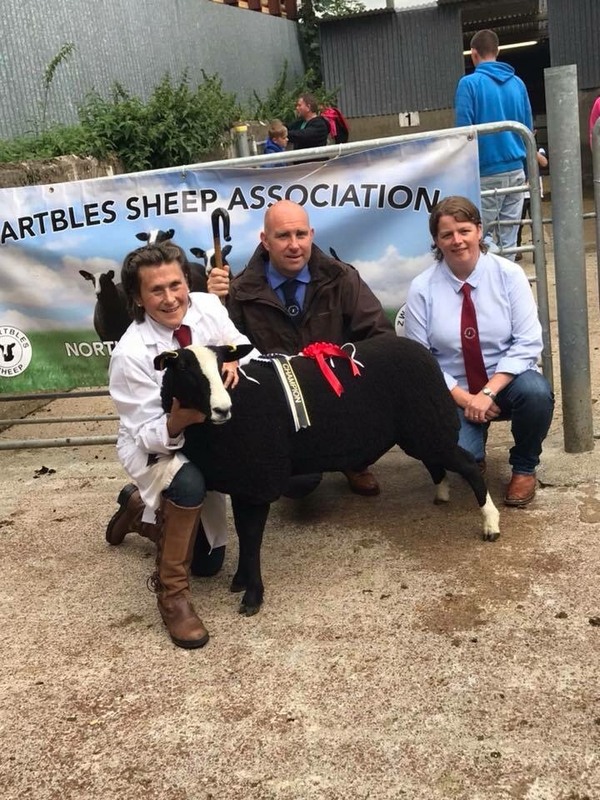 On Saturday 18th August 2018, the Northern Ireland Zwartbles Sheep Association held their annual branch show and sale at Gortin Mart, Country Tyrone. This was the first time an NIZSA event had been held there and the 61 sheep to come through the ring were in great demand. In the pre-sale show it was over to judge Mr Colin Rae of the Wallacetown flock, Dumfries. His Supreme and Reserve Supreme Champion came out of the same “field” from Mary and Dean Cashel’s flock in Ballinamallard. The highest price of the day went to the Supreme Champion, “Hillview Fandango”. This was an elegant ewe lamb which caught the eye of many. She was knocked down to Brian Malcomson, Ballynahinch at 600gns. The second highest price of the day went to the reserve at 520gns. This shearling gimmer had been shown throughout the season picking up many rosettes, demonstrating her desirable breed traits. “Hillview Echo” was sold also to Mr Malcomson. Each individual classes average sale price and clearance percentages increased drastically in comparison to the 2017 sale The average price for Zwartbles males was up 50gns at 270gns with an astounding 100% clearance. The highest priced male was “Hillview Finn McCool”, this ram lamb stood male champion and his sire was a Scottish bred ram, Craigies Da Boss. He sold for 340gns to pedigree breeder Matthew McCaughey, Coleraine. Shearling rams averaged 230gns with 100% clearance and ram lambs averaged 297gns again with 100% clearance. Shearling ewes averaged 215gns up 10gns with 88% clearance. Ewe lambs averaged 219gns. Crossbred females then followed the pedigree sale, they averaged £93, similar to last year reiterating the market for Zwartbles bred females to cross with terminal sires. Zwartbles ewes have proved to lamb down with a great abundance of milk, and their mothering ability is second to none. This along with the popularity of their distinctive look shows the future of Zwartbles is bright. Special thanks must go to judge Mr Colin Rae, auctioneer Richard Beattie, Elaine Anderson, Judy Maxwell, Rachel Megarrell and Irwins Feed who sponsored the show with 10 bags of intensive lamb pellets. More information on Zwartbles sheep can be found on the NIZSA Facebook page and online at www.zwarbles.org.